Bead Size 29-40 mm diameter. See image with penny for size comparison (US penny is 19 mm diameter). Strand Length 34 inches (including string/raffia). 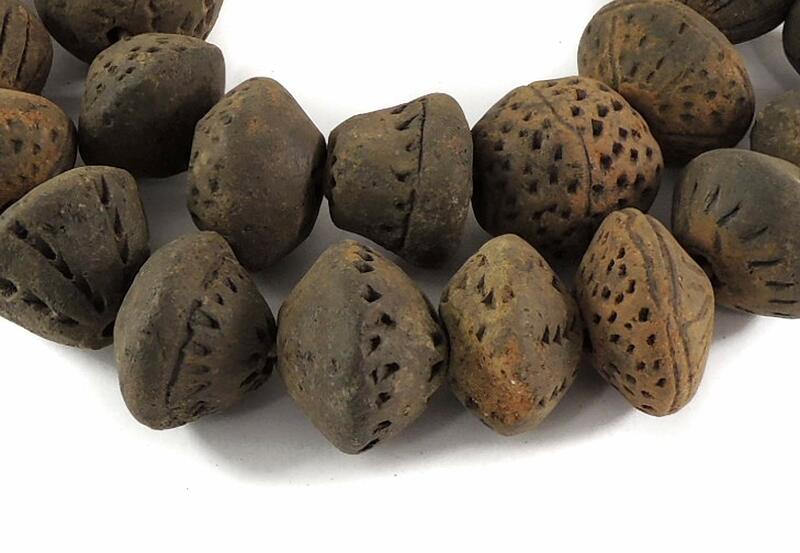 Additional information: To learn more about these and other fascinating ancient beads please read A BEAD TIMELINE (Lankton). These are old terracotta spindles whorls from the Djoboro and Timbuktu regions of the inland Niger Delta in Mali, Africa. Spindle whorls were used for balancing the spindle as yarn was being spun. They were placed over the spindle and were loose enough to spin as the spindle was twirled back and worth. Spindles were made of both wood and metal. These spinning aids have been used throughout the world for centuries and come from all cultures. Spindles whorls were carved from stone, shaped from bone, and often created with clay. The smaller and more delicate whorls were made for spinning silk. The smaller and more delicate whorls were made for spinning silk. Spindle whorls are typically, but not always, disk shaped objects with one side flat and the other side conical (or convex, if you prefer) and sometimes with a conical perforation. Some of them were plain while others had very intricate designs. 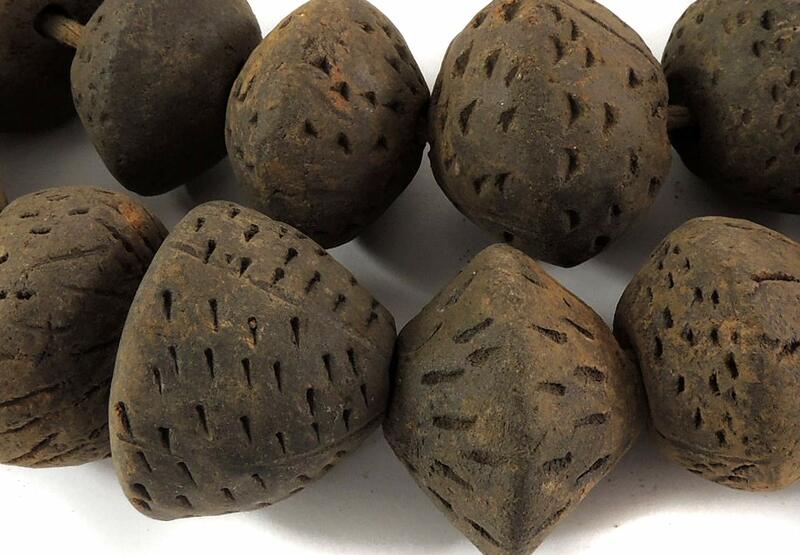 The old clay whorls from Africa were often covered with many incised lines. 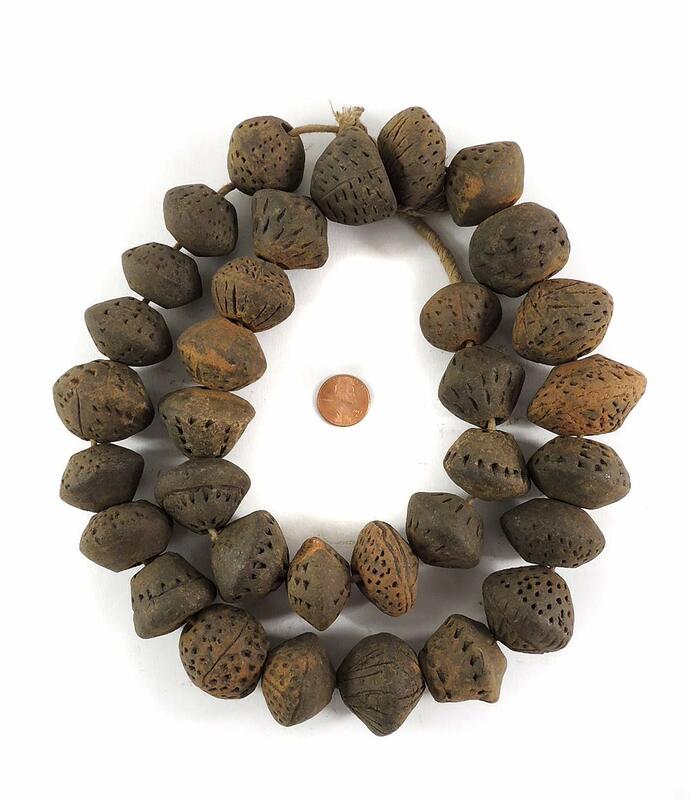 Large clay spindle whorls like these have been found in the Niger Delta at settlements dating to the 11th and 12th centuries. It is speculated that spinning and spindle whorls started in this region because of the North African or Islamic influence on the delta culture during this same period. Although spindle whorls have a perfect perforation for stinging this was not their original intent. Perhaps they could have been strung on a cord for transport but typically not worn as jewelry. You can see how strings of them were hung on old Dogon cliff dwellings in AFRICA ADORNED (Fisher). However; these are beautiful handmade objects and look lovely worked into both bold and delicate necklaces. Just recently small clay spindle whorls similar to Malian spindle whorls were discovered at the Howell Site, a colonial compound in North Carolina. This site and its content have been dated to between the 1740s and 1780s and is documented as having slaves from Africa.